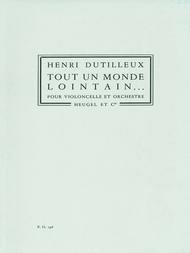 Composed by Henri Dutilleux (1916-). Leduc. Classical. Score Only. Heugel & Cie #ALHE32207. Published by Heugel & Cie (HL.48188171). Henri Dutilleux (1916-2013) was greatly influenced by his contemporaries, Ravel, Debussy and Roussel, yet implemented his own, unique style. His Cello Concerto, Tout Un Monde Lontain is considered to be one of the most important 20th century additions to the instrument's repertoire. This Dutilleux Concerto comprises five movements which run seamlessly in to one-another, each inspired by the poetry of Charles Baudelaire. The movements are: 1) Énigme (Enigma), 2) Regard (Gaze), 3) Houles (Surges), 4) Miroirs (Mirrors), and 5) Hymne (Hymn). Tout Un Monde Lontain was first performed in July 1970 by Russiancellist, Mstislav Rostropovich with the Orchestre de Paris. 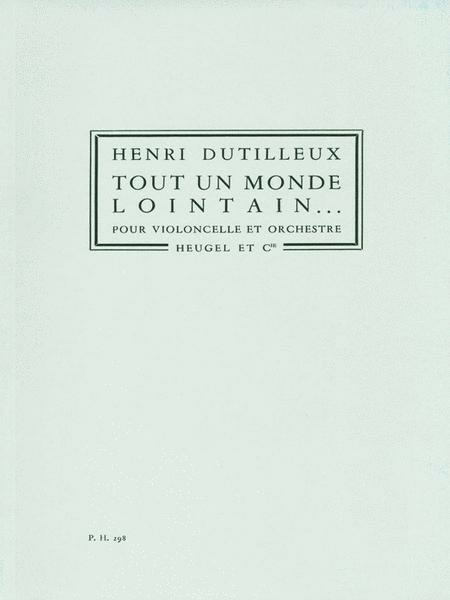 Dutilleux's Tout Un Monde Lontain remains popular to this day, and including the entire orchestral score, this edition is essential to the advanced cellist's repertoire.